During this journey to Venice he slept in the piazzas because of the measures taken against the plague. Once it happened that as he awoke in the morning, he met a man who, seeing that he was alive, took to his heels with fright, because he must have appeared extremely pale. Continuing his journey he reached Chioggia, and from some companions who had joined him he learned that they would not be allowed to enter Venice. These companions decided to go to Padua to get a health certificate and he went along with them. But as they traveled at a good pace, he could not keep up with them, and they left him at nightfall in a large field. While he was here Christ appeared to him as he was accustomed to, as we have already described, and strengthened him considerably. With this consolation, the next morning, without forging a certificate as, I think, his companions had done, he arrived at the gates of Padua and went in, the guards making no demands of him. The same thing happened when he left the city, at which his companions were taken very much by surprise, as they had come to get a certificate to go to Venice, about which he did not trouble himself. On their arrival at Venice, the officials came to the boat to examine all the passengers, one after the other. Him alone they left undisturbed. In Venice he maintained himself by begging, and slept in the Piazza of St. Mark. He did not care to go to the house of the Ambassador of the Emperor, nor to make any special effort to find something with which to get along. He had a deep certainty in his soul that God must give him the means of getting to Jerusalem, and this gave him such confidence that no reasons or fears suggested by others were enough to make him doubt. One day a rich Spaniard met him and asked him what he was doing and where he wanted to go. Learning his intention, he took him home for dinner, and kept him there for several days until arrangements were made for his departure. From his Manresa days the pilgrim had this custom that when he ate with anyone, he never spoke at table, unless to answer briefly; but he listened to the conversation and made note of some things, from which he later took occasion to speak of God. When the meal is over, that is what he did. That is why this good man with all his family took such a liking to him that they wanted him to remain with them, and made an effort to keep him in the house. His host himself brought him to talk with the Doge of Venice. When the Doge heard the pilgrim, he gave orders to give him passage in the Governor’s ship which was sailing to Cyprus. There’s something about Ignatius. We’ve seen it before in his story. At times, he just seems to get what he wants. Sure, we have a sense that God takes care of him. But there also seems to be something about Ignatius himself—his presence, his charisma—that draws others to him. Indeed, there is a stark contrast from the beginning of this passage to the end. It begins with the “undead” looking Ignatius scaring the Hell out of somebody! But by the end, we have a rich Spaniard going out of his way to get Ignatius what he needs! He casually mentions, as an aside, that “Christ appeared to him as he was accustomed to . 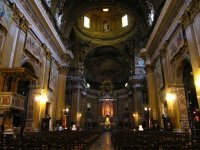 . . and strengthened him considerably.” But this encounter with Christ, no matter how ordinary Ignatius makes it appear, seems to make the difference. The next thing we know, he’s passing by, as if invisible, the city’s guards. Is there something about our encounter with Christ that can make us appear different? Now I don’t consider myself a particularly charismatic person. 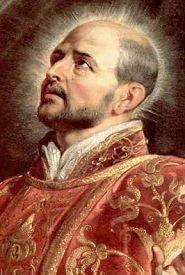 Saint Ignatius, I expect, like John Paul II, probably had a natural charisma which immediately attracted people to him. That’s not really been my experience. However, I have found that at times when I’m giving a talk, or offering spiritual direction, something changes in the quality of the encounter. I realize that my audience is in rapt attention, or the individual I am working with is being particularly responsive. Suddenly, I sense that Christ is present, working through me in a particularly powerful way. And I am tempted to step back, to end the moment, surely this is too much for me to be doing, too privileged a position. I expect that part of what made someone like Saint Ignatius so effective is that he was able to give himself over to such an encounter, to overcome any hesitation and let himself be used in a powerful way. Even this early in Ignatius’ journey to sainthood, we can begin to see it here. In The Sickness Unto Death, the philosopher Soren Kierkegaard speaks of us as being “offended” by God’s coming so close. How can the transcendent God come so close to my unworthy self? How could I not offend by entering into this mystery? The frequent result to this offense, Kierkegaard observes, is to fall into despair. However, the challenge for Christians, he insists, is to look this offense right in the face and accept it, moving to faith in that mystery that is, rather than to the despair of, “How could this be?” As I described in my own experience, this is not necessarily so easy, and it may take some time to get there. How do we get there? As in the case of Ignatius, we get there by giving ourselves over to this mystery and allowing God to use us more and more. humility is accepting that when those moments happen it isn't you, but Christ in you, and moving on and through them. As you say, easier said than done. We either get freaked out or puffed up. True humility is when we allow ourselves to be used as an instrument without having either happen. Maybe that is where having kids helps, parents know how that feels. That was great. It reminded me of the scene from "Man for All Seasons" where Sir Thomas Moore explains to his daughter that we must do some things "even at the risk of being a hero." Can humility be understood as separating myself from the idea that I am the authoritative cause? Also giving up thinking I have authoritative understanding. And practicality ... In asserting the practical choice, I am asserting certainty of self-sufficiency. And that self-sufficiency is judged by my power, the likelihood of results or utility. Practicality seems contractual where as humility is dependant on grace. And a further separation -- practicality is considered an expression of wisdom, but humility implies a risk, a willingness to be thought foolish. Mark also mentioned a hesitation when we recognize a power within us that is beyond our capacity - a goodness that is not our own. Is that desire to step back humility - or a remnant of contractual logic? To know that you have to answer another question - Is this experience real? Can I certify its authenticity if I can’t attribute myself as the cause? Perhaps, that is the point where humility and practicality intersect. Whether we are discovering our sincere selves or the authentic in the world around us – the things that are real are the things we can’t do without (sort of like the 1st principle). And what we cannot do without is our daily bread. Maybe, then the balance between practicality and humility is found when we accept our daily bread as something unequal to what we can provide for ourselves? If so, then true Christian practicality/humility is not contract between cause and effect – but an equality between need and provision. What we need is not what we can do for ourselves – wow, ponder the implications. I'd have to think about that for a very long time before I said anything that made any sense and/or was worth the time it would take anyone to read it. I know that part of my problem in trying to balance (a) humility with (b) whatever God plans on doing through me is that I was raised by overachieving southern parents, who taught me that anything short of the best was failure, but if I realized I was the best, that would be sinful.